All Grass Sports Surfaces offers customers the choice of resurfacing existing courts or designing and constructing new ones. We offer a full tennis court and sports field design and construction package. Our personalised customer service includes on-site meetings, obligation-free quotations, assistance with development applications, liaison with architectural and engineering consultants if required, earthworks, base construction, surfacing, fencing, lighting, net posts, nets and ancillary equipment. Mark Edmondson personally oversees all aspects of your project to ensure your tennis court or sports surface provides you with a quality playing experience for years to come. As well as tennis courts, All Grass Sports Surfaces installs basketball courts, netball courts, volleyball courts, Futsal fields, multi-sport courts, indoor sports flooring, artificial leisure lawns, cricket wickets, cricket practice nets, cricket pitches, schoolyards and recreational areas including artificial turf surfaced balconies. 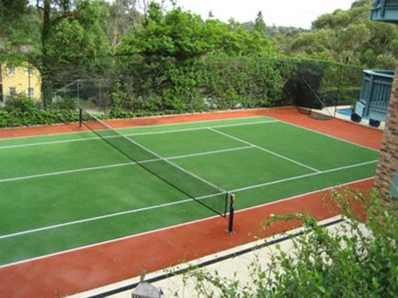 We have extensive experience in installing synthetic grass, acrylic (hard) courts and clay court surfaces. No job is considered too big or too small for All Grass Sports Surfaces. We also offer repairs, ongoing maintenance and professional cleaning of all sports surfaces. Our installation team members receive thorough training in all aspects of tennis court and sports field construction, surfacing and maintenance. We do not sub-contract to other companies. Our team members are all employees of All Grass Sports Surfaces. All Grass Sports Surfaces holds a current NSW Builders Licence for tennis court construction – Licence # 31255C and is fully insured. Our workers hold white cards and are trained in WHS procedures. All Grass Sports Surfaces has been an accredited member of the Sports Contractors Association Limited (formerly the Tennis Court & Sportsfield Builders Association) for over 12 years in the Builder Member division. All Grass Sports Surfaces’ owner, Mark Edmondson, has been the President of the Sports Contractors Association since 2004. All Grass Sports Surfaces is a builder member of the Housing Industry Association of Australia. Contact us now to discuss your tennis court or sports field construction options.